Patricia Ann Mayes, age 82, of Bluffton, SC and formerly of New Holland and Ephrata, PA died Tuesday, January 29, 2019 at her home. Mom was born 1/31/36 in Grove City, PA to Claire and Vera Armstrong and graduated Grove City High School in 1953. In 1955 she would marry Thomas A. Mayes with whom she would spend the next 63 blissful years. Pat and Tom moved to New Holland, PA before the birth of their first son and Pat would find her dream job working for Eastern Lancaster County School District as a reading and math tutor for 21 yrs until retiring in 1993.She was a very loving mother to 5 children and taught them all love and compassion and a spirit of generosity towards others. She was also a lover of all types of animals especially her faithful companions Ella and Buddy. She spent her mornings in retirement nurturing and feeding the many ducks, geese and turtles that would congregate off the lagoon in her backyard. But her biggest love was always children. 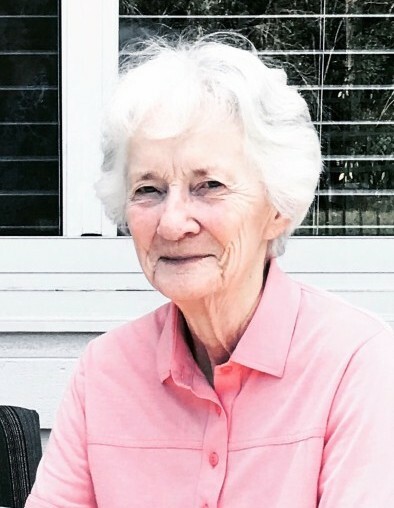 She never missed a meaningful occasion of her children and 7 grandchildren or the opportunity to spend time with her 6 great grandchildren, whom she loved more than life itself. God blessed her with a caring heart and a giving nature. This allowed her to volunteer and give some of what she had to those less fortunate than her. One of the volunteer activities that she enjoyed the most was working at the Calhoun Station Thrift store, where she made many new friends and had the privilege of serving on their Board of Directors. She was preceded in death by her sons Stephen D. Mayes and Daniel T. Mayes; as well as her brother, Brig. Gen. Robert A. Armstrong. She is survived by her husband of 63 yrs, Thomas A. Mayes and her three living children, Eric L. Mayes (Donna A), Leeann Mayes and Michael P. Mayes M.D. (Lori A). With the passing of our beloved mom, we realize that it must have meant that God needed another Angel in Heaven. For those with the same spirit of generosity as our mom, we ask that, in lieu of flowers, a donation could be sent to the Hilton Head Humane Association or the Calhoun Station Thrift Store. A service for our mom will be planned for the Springtime at St Stephens Church in New Holland, PA with details to be released at a later date.